A Dream To Believe In, Vol. 2 is the second installment in Nicole's thematic album trilogy. 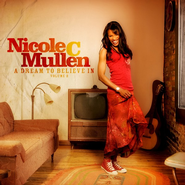 While Sharecropper's Seed had an organic, acoustic sound, A Dream To Believe In, Vol. 2 leans strongly in the opposite direction, with a very contemporary pop sound reminiscent of artists like Beyonce and Janet Jackson. Songs on A Dream To Believe In, Vol. 2 were inspired by many great moments in our national history that have significant importance to our faith walk with God.